We took EldestGirl to the Magic Kingdom when she was almost two. It was not a great day. It was about 30 degrees, and whilst the Magic Kingdom itself was lovely, it’s a pain in the arse to actually get to all the Disney goodness. Firstly there’s a drive from wherever you’re staying. Then a shuttle bus from the car park to security. Then you get to join a long line to have your bags searched. Then you get either the monorail or the boat to Magic Kingdom. Then you join a line to go through the entry turnstiles. Remembering you probably have to wait a minimum of five, sometimes ten minutes between each of these stages, with a nearly two year-old in humid heat, the day was pretty much over before it began. She had had enough by the time we got through into the park. I adore theme parks and wanted to keep going; TheBloke (TM) basically had to wrestle me home at about midday for the sake of EldestGirl. It was not a good use of two adult park-hopper day tickets. So, tough decision though it was, we decided on this Florida trip not to take YoungestGirl to the parks. 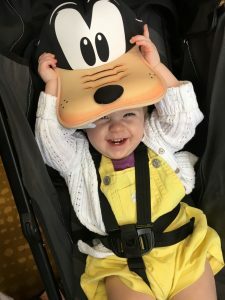 Very conscious of later questions down the line (“Mummy, why has EldestGirl been to Disney World twice and I have never been once, not even once at all?”) we decided we should do something based in Disney World primarily for YoungestGirl too. Enter Chef Mickey’s. We picked a brunch as the best time to go. We couldn’t tell EldestGirl we were having brunch though, as she has an irrational hatred of the concept of brunch, shrieking melodramatically, “Brunch, oh no!” if you mention it to her. I suspect she thinks she’s being conned out of a meal somewhere along the line. 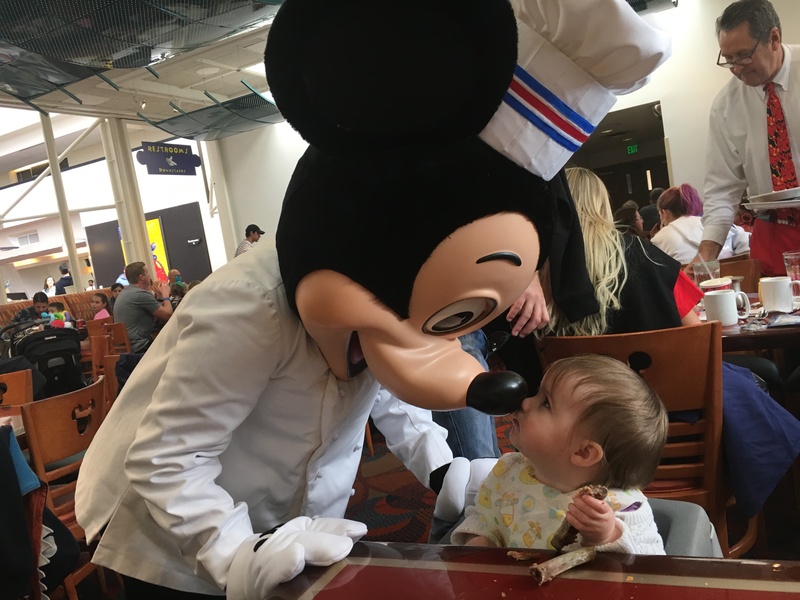 So we told her we were having an early lunch at Chef Mickey’s. 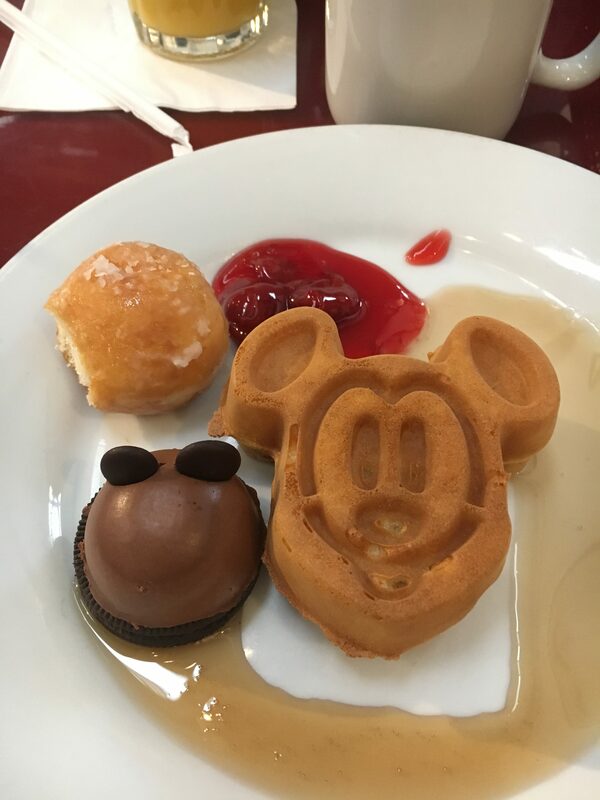 C hef Mickey’s is a buffet, meaning there’s an array of different foods, and you simply help yourself – and go back as many times as you want. The quality of the food was great (smoked salmon, Krispy Kreme donuts, Caesar salad – sometimes on the same plate), but the range was nowhere near as extensive as the Golden Corral (more on that another day). Of course, the highlight of Chef Mickey’s is the moment all the characters come out, and are wrangled by servers to make sure they attend each table in turn. We almost had a meltdown because Mickey came to our table just as EldestGirl had gone away from the table to the buffet bar to stuff her face with some more Mickey-shaped waffles, but a quick word with our server meant that he was back at our table again within a few minutes for her to say hi to the real mouse, as she ate his waffley-effigy. There was always the gamble that YoungestGirl would hate it. She is very wary around strangers. But she took the giant animals in her stride, and threw an especially large piece of smoked salmon on the floor for Pluto to eat, which I think signals affection in her world. All this, however, was thrown into the shade by the absolute most memorable part of the meal. When we had all finis hed eating and were getting ready to go, TheBloke (TM) noticed there was a nappy shituation. It was my turn. Readers, I was in the toilets for a good twenty minutes. Every item of her clothing was soiled. Other mothers and grandmothers were walking past and sympathising with me, as if something truly dreadful had happened. It had. And – jetlagged and having been through two babygros on the flight – I didn’t have any spare trousers for YoungestGirl in my changing bag. So she was duly wheeled back through Chef Mickey’s wearing nothing but a nappy, an elephant t-shirt and a smile. Though smelling rather better than she did before.